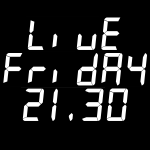 Obviously, to keep in line with our current level of live listener expectation, when I say 21:30, I do of course mean approximately 21:30. We currently start the live recording about 15 minutes after the advertised start time. This is to allow our plethora of live listeners to congregate and get settled, and nothing to do with our inability to get ourselves sorted in time. Honest. We will try and start as close to 21:30 as possible, meaning that the net delay of the live recording will only be between 15 and 20 minutes. Looking at the number of people who are still in the live chatroom beyond the finish of the live recording, I don’t think that this will be a problem for most. And if you need a reminder, the live chatroom can be found at thebugcast.org/live.